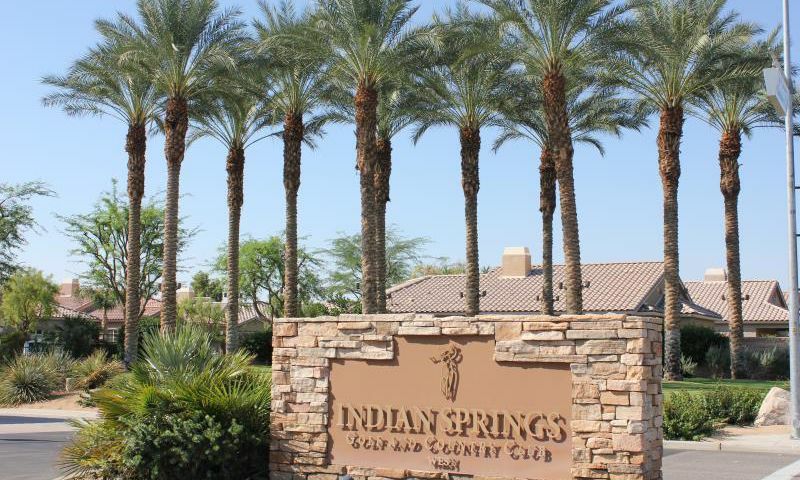 Indian Springs Golf and Country Club is an exquisite active lifestyle community in Indio, California. Inside the gates of this exclusive country club, you’ll find both tranquility and activity. Residents enjoy a graceful and carefree lifestyle with club amenities, manicured grounds and a spectacular golf course. Established in 2001, Indian Springs Golf and Country Club features 709 well-crafted single-family homes that are perfect for today’s homebuyer. There is a home for every buyer with breathtaking mountain views. The community's beautiful setting, amenities and world-class golf have lured many to this desert haven. The beautiful clubhouse is the hub for all social and physical activities within Indian Springs Golf and Country Club. Homeowners can workout in one of the two fitness centers or join neighbors for a party in the multi-purpose room. Residents can soak up the California sun at both outdoor pools or host a happy hour on the patio. The stunning 18-hole Indian Springs Golf Course winds through the grounds of the community. This beautifully manicured course offers 6,794 yards of play that are exciting, yet challenging. Residents can even practice their game at the short game facility or two putting greens before hitting the course. The Clubhouse Grille is the perfect place to grab a bite to eat after a long day on the course. There is even a pro shop for all of your golf needs. Indian Springs Golf and Country Club is an established community of 709 residences built between 2001 and 2005. There are ten models offered on a resale basis that range in size from1,529 to 2,716 square feet. These beautiful single-family homes feature two to four bedrooms, two to four bathrooms and a two to three-car garage. Each home was thoughtfully designed with open layouts and spacious master suites. Some homes also have a casita perfect for when guests are visiting. Homeowners love adoring the beautiful mountain, golf course, and sunset views. Indian Springs Golf and Country Club offers an affordable country club lifestyle in a beautiful location with low-maintenance homes. Indian Springs Golf and Country Club’s residents enjoy an active lifestyle with friends and neighbors. Residents often gather in the clubhouse for community events or enjoy a round of golf with friends and family. Homeowners have more time to explore new hobbies because the homeowners' association tends to yard maintenance. Indian Springs Golf and Country Club is located in Indio, California off of Jefferson Street. Its ideal location on the border of La Quinta and Indio allows easy access to shopping, entertainment, dining, and medical facilities. The Westfield Mall, El Paseo Shopping Center and Cabazon Outlet Mall provide a variety of stores for your shopping needs. Residents can satisfy their taste buds with the abundance of fine dining, have a night on the town gambling at one of the casinos or hike and bike throughout the surrounding mountains. Travel farther from the community is made easy with many airports only two hours away including the Palm Springs International Airport, Los Angeles International Airport (LAX), Long Beach Airport, John Wayne Airport and San Diego International Airport. The warm weather and 356 days of sunshine a year have drawn retirees and active adults to the region for decades. Check back soon for more information on the lifestyle in Indian Springs Golf and Country Club. Indian Springs Golf and Country Club is an established community of 709 residences built between 2001 and 2005. There are ten models offered on a resale basis that range in size from 1,529 to 2,716 square feet. These beautiful single-family homes feature two to four bedrooms, two to four bathrooms and a two to three-car garage. Some homes also have a casita perfect for when guests are visiting. Homeowners love adoring the beautiful mountain, golf course, and sunset views. We love our home here at Indian Springs. The community is very friendly and the amenities are nice. My husband and I both enjoy golfing and being active whether we're at the gym, swimming or out for a walk. We really enjoy living here and have made wonderful new friends. For everything you get here I would say it's a great value in a great location. There are tons of things to do, activities, events and ways to be an active member of your community. 55places.com is not affiliated with the developer(s) or homeowners association of Indian Springs Golf and Country Club. The information you submit is distributed to a 55places.com Partner Agent, who is a licensed real estate agent. The information regarding Indian Springs Golf and Country Club has not been verified or approved by the developer or homeowners association. Please verify all information prior to purchasing. 55places.com is not responsible for any errors regarding the information displayed on this website.